I shouldn't have assumed, but when my pal Capt. Richard Seward shouted "Got one," the scenario seemed to make it a foregone conclusion. We were both in waders and standing on the side of the small channel winding its way out of a small creek in Upper Tampa Bay. It's winter, Seward's throwing his favorite lure, a 52M MirrOlure, so 9 times out of 10, "Got One" means speckled trout. Well, this time it meant something different - flounder. Indeed, a legal size flatfish fluttered up from the sand to smack that twitchbait and get his picture taken. Ten minutes later, one of his brethren grabbed my DOA shrimp and not long after, Seward nabbed another on a curly tail jig. Clearly, the outgoing tide had a host of fish facing into the current's food delivery service. Had our schedule not pushed us onward, we probably could have reached double digits on flounder in short order - and that's just one location. 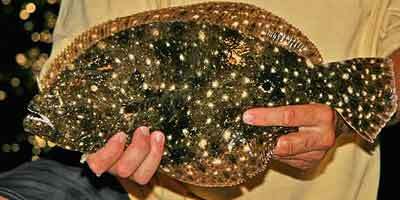 The fact is, the last few years have seen a remarkable surge in flounder catches along the Central Gulf Coast. The jury's still out on the debate over whether we literally have more flounder, or if more anglers are figuring out how to catch them. Regardless, if you like these delicate white filets and you have the skill for detecting often subtle bites, this is a good time of year to grab your limit and enjoy some surprisingly sporty action in the process. GRASS FLAT GANG: Prior to the uptick of attention, the majority of area flounder were caught incidentally by anglers drifting grass flats. In the classic scenario, a line would come tight without much motion and unwitting angler assumed he'd snagged the grass. A quick pop freed the line, but it's a safe bet that many of those grass snaggings were actually flounder that spit your bait. Indeed, one of the flounder's favorite ambush points is the edge of a pothole or a sandy strip amid broken bottom. Those who've learned to work their artificials all the way to the sand's edge often see their flounder count increase. Shad or curly tail jigs, as well as jerkbaits, work well when bounced along these borders. The key to all flounder presentations is a slow presentation, so don't hesitate to simply drag jigs across the sand. For optimal presentation time, try dragging a light Carolina rig with a jig, jerkbait, artificial shrimp or live bait (pilchard or shrimp). Assemble the rig with a 1/2- to 1-ounce slip sinker on your main line above the swivel connecting to an 18-inch fluorocarbon leader. With a glacially slow pace, the sinker bumps the bottom to get the fish's attention and then the bait comes drifting past within easy reach. ROCK STARS: On a recent grouper/sea bass trip off Homosassa, Capt. William Toney noted that flounder have been caught fairly regularly in the 15- to 20-foot range that he commonly fishes. Not long after that statement, a nice 20-incher grabbed one of the soft body swimbaits we were throwing. As Toney noted, the flounder hold over the sandy perimeters, and they tend to favor the notches and alleys between two prominent rock sections. The key is to slow your retrieve once you reach the end of the rocks and let the bait tumble onto the sand. Keep the bait moving so it looks like real prey, but an intermittent retrieve allows the bait to bump the bottom. That creates noise and vibration to alert the flounder of approaching food. Jigs and soft plastic jerkbaits also work here. DOCKS DELIVER: Anglers working marinas and residential canals often miss a significant flounder opportunity because they're too focused on hitting all the different angles. In many cases, if you commit to soaking a bait under the deep end of a dock - preferably where a boat's prop has scoured a deeper hole - you'll find a willing flounder. Options vary, but give this one a try: Hook a finger mullet or a small pinfish through the lips with a 1/4- to 3/8-ounce jig head and sling it under the structure. With the lead head hindering the bait's movement, flounder don't have to move far, so pay close attention for a subtle twitch and wind down on anything that feels like a bite. Consider also that the same dock lights that yield trout, snook, ladyfish and the like will also attract flounder. The flatties can't directly compete with the swifter predators, but they'll hang near the lights looking for opportunities. Mix up your presentations with some deeper baits and enjoy the afterhours flounder action. PIER PURPOSE: While others rocket their baits as far as they can from the manmade reef upon which you're standing, sling a shad or curly tail jig uptide beneath the pier and let the water move it naturally across the sand below. A live shrimp hooked tail-first on a jig head also works. Flounder utilize the pilings as current breaks and make a good living on the many forage sources piers attract. The Central Gulf Coast offers numerous opportunities for bagging your flounder dinner, but take time to learn the proper filet technique. Two key points: First, remember that there are two filets on the top (colored) side and two more on the lighter underside. Also, keep your filet knife at a 45-degree angle when cutting filets away from the rib cage. These fish may be relatively abundant, but you won't want to waste any of the flounder's delicious meat.